Underpainting Transparent Base is a fast-drying, alkyd paste medium, similar to Velázquez Medium in handling properties, but much faster drying. This alkyd paste medium consists of finely ground calcite (ground calcium carbonate) and wollastonite in alkyd with mineral spirits. Use it to extend paint and form impastos while making paint longer. 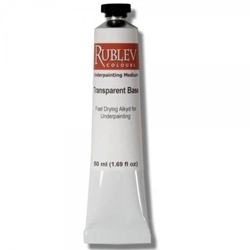 Makes colors slightly transparent allowing greater control over tints without using whites. Dries to a matte finish. Does not contain driers.